Every year we honor the memories and celebrate our Cat Wisdom 101 cats on National Pet Memorial Day. We’re late but ended up creating two posts today for Rosh Hashanah Cats. This year I thought it would be meaningful to include a few of my pre-internet cats from a treasure trove of old photos. I’m also sharing a graphic I made ages ago because I believe we have guardian angel cats. For every image I post at Cat Wisdom 101, there two or ten images, art work, graphics I don’t. Non-cat photography is my secret passion. A recent search uncovered masses of fabulous cat art and non-cat photography files I’d forgotten about. I figured why not combine the best of both? Do you agree they deserve to be edited and shared? I’ve enjoyed many pets since early childhood most mostly cats. Their lives have enriched my life beyond measure but it’s time for me to reconsider what responsible pet ownership really means. Way, way back like 35 years to my life of a cat lady. 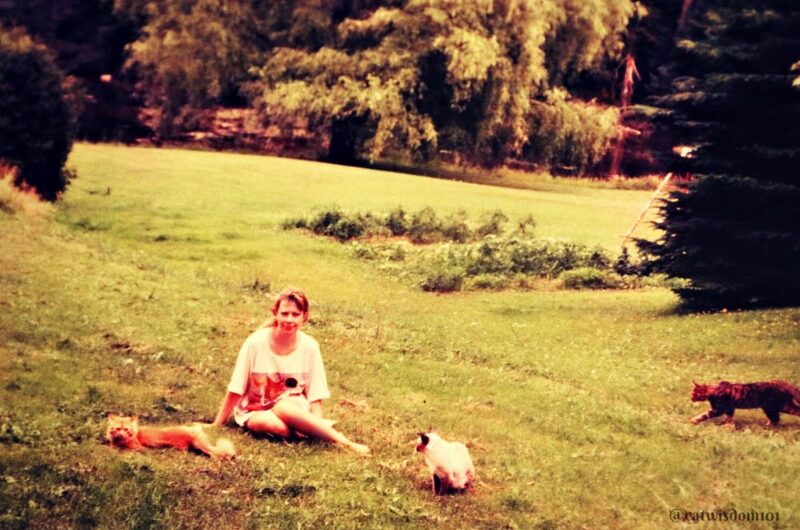 Once a cat lady always a cat lady. The last few years have taken their toll with 24/7 cat care, palliative and special needs cat care. It’s meant lifestyle restrictions and a growing health (physical and emotional) plus a financial burden we can no longer afford. The impact of cat care responsibilities during chronic illness was the elephant in the room. My cats are #1 and always have been. In the lean times of my youth, my cats ate before I did. Every home was rented or purchased with cats in mind. If I had to travel as I did a lot in my 30s and 40s, I went to great lengths to find the right live-in cat sitter. Every day is struggle between cat care duty and self-care responsibility. With four cats with growing health care issues from neurological, hearing loss, kidney disease, diabetes, it’s always something. Our two indoor/outdoor cats need safe flea/tick protection and deworming. No easy task with a senior former feral who is FIV+ Odin, our adventure cat’s middle name is mischief. Burn out is real. Compassion fatigue is rampant in the shelter/rescue world. I’ve experienced it first hand and seen well-meaning cat lovers fall prey to the under belly of cat love to hoarding or neglect. Cats are brilliant mirrors. They will bring out our best or worst to examine if we’re self-aware. 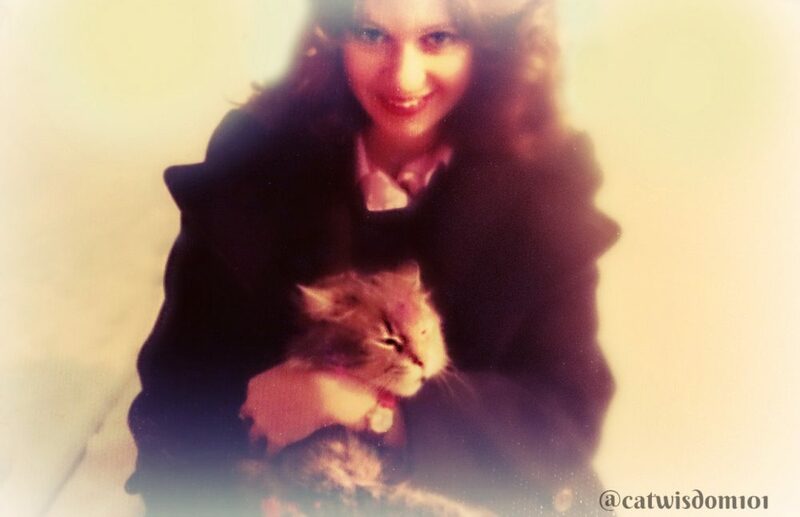 It feels like a million years ago when I was a sweet sixteen cat lover with Mr. Mew. He was my first stray cat who found me at a dark teenage-angsty time. It’s with mixed emotions to announce, there will be no more cat adoptions in our household. Yes, Clyde will be our last cat. Kittens have been out of the question since we adopted Odin in 2011. Cats live well into their twenties like our Merlin did and it would be a responsibility, I’m not willing to take with a husband nearing 70. I know seniors love adopting cats and I’m a big fan of seniors fostering senior cats. It remains to be seen if we will. Ask me in another ten years. 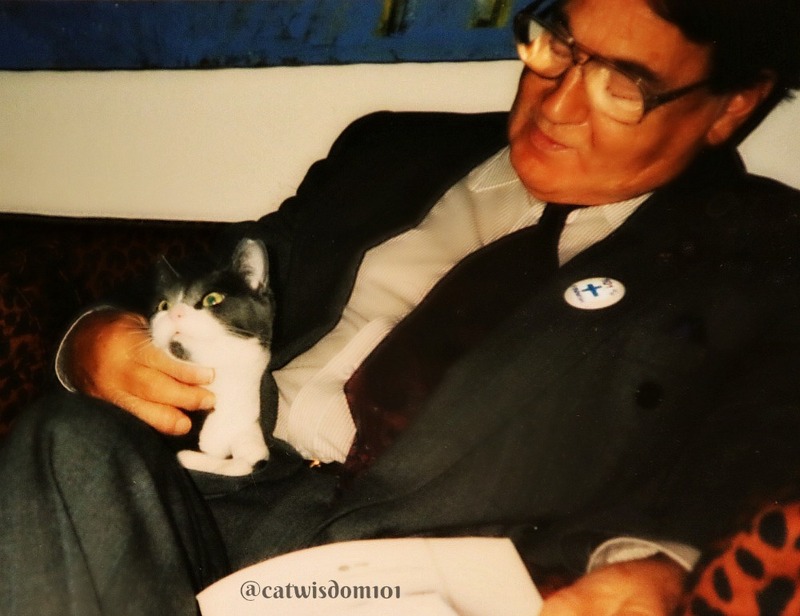 My dad, a natural cat whisperer with Miss Mew, a very troubled cat I adopted in the early ’90s. Miss M was found in a snowdrift with her tail chopped off. The person who found her tried to help but she never adjusted to his other cats. I was in a rare state of catlessness and agreed to adopt her. There was nothing physically wrong with her but she was perma-pissed off despite being loved and accepted. She loved to sit in the middle of my large Persian rug, look me straight in the eye and pee up a storm. Nothing worked. She never adjusted or came to terms with her past trauma. Against my best judgment, she insisted on an outdoor life. Maybe that’s was how she ended up in a snowdrift, but going outdoors was the only thing that made her happy. I can honestly say, I have no regrets and have a deeper understanding of the mysteries of life, death and destiny. Back then I lived on a quiet street where I fed a feral colony in the backyard (it was where my cat Merlin, the neighborhood ambassador was friends with everyone). One day Miss Mew shot out, a cat with a mission, and never returned. I went door to door, posted flyers, even visited a psychic who I sensed was b.s. “I see her lying underneath a tree. She’s alive and well”. That’s where I lived. I was grateful for the knowledge but wished I’d seen her before the street cleaners swept her up. Photo blooper from taking a photo of two photos. 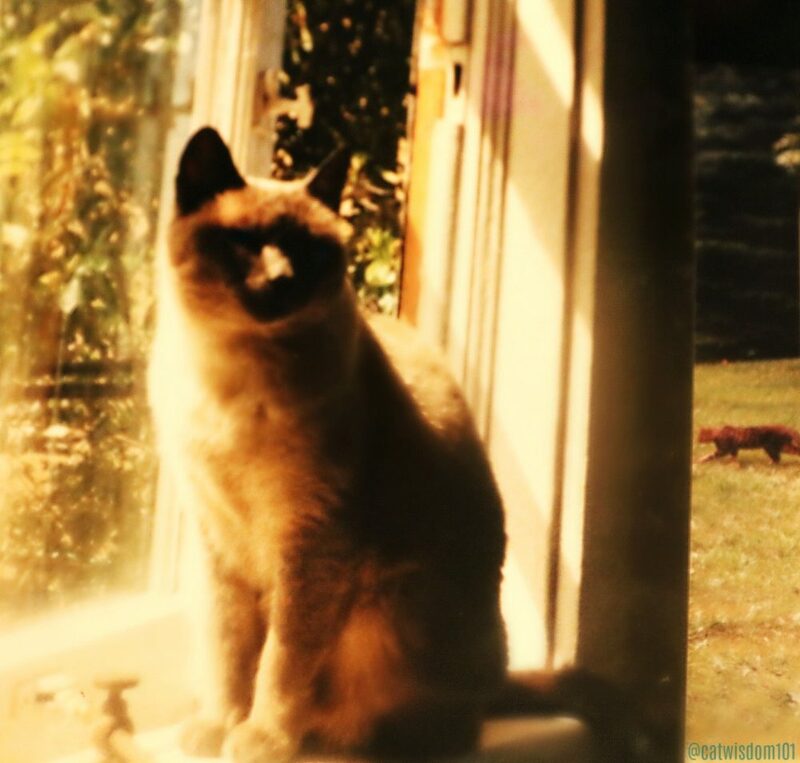 This is my first Siamese, Mergatroyd, my best friend from age 18 to 35. Forever loved. My parents adopted several cats from age 70 to 90. Luckily for the cats, they pre-deceased my parents. Most of the time however, it’s the other way around and cats of every age wind up in shelters when their owners die, become ill or move to an assisted living facility. Life is unpredictable and more than ever, I feel the need to do what’s responsible for any remaining cats in my life. When I launched in 2011, there was Merlin, Domino, Gris Gris and Odin. The roster has changed over the years swelling to seven (with fosters) and down to a low of two but four seems to be our sweet spot. Domino and Odin are still with us while Nou Nou and Clyde are our latest and last cats. They are all aging (Clyde turns 19 in January) so it’s possible we will be catless within a few years. Fostering of course remains an option but it requires time and energy. Some may call it selfish or stupid to consider a life without cats in old age, but I’d like to travel without worrying and missing my babies. I’m grappling with how to travel in the coming year after I cancelled a trip this summer, one I’d spent months planning. What does this mean for Cat Wisdom 101? We have too much wonderful content to vanish anytime soon, if ever. While there won’t be any new cats on the horizon, our current kitties and angel cats will continue to make their presence felt. 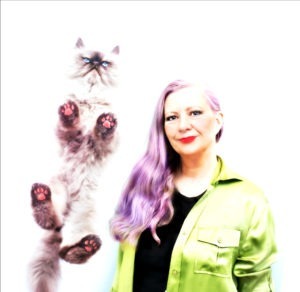 More than ever, the idea of sharing rare vintage or unusual cat art appeals. There is much to celebrate in the world of cats. Today, hug your beloveds and little closer and remember with full hearts the ones who live on in our memories. One of my fondest memories is a female ginger tabby. My first husband named her Phyllis but I called her Billy Beans. Billy for Billy Holliday and Beans because she had cute pink “toe beans”. She showed up one day begging for food at at our neighbor’s BBQ. They shooed her away and she made her way over to us. At first glance, she looked healthy with her long fluffy fur but it hid her starved and bony body. We already had two cats and Billy was welcomed home with open arms. 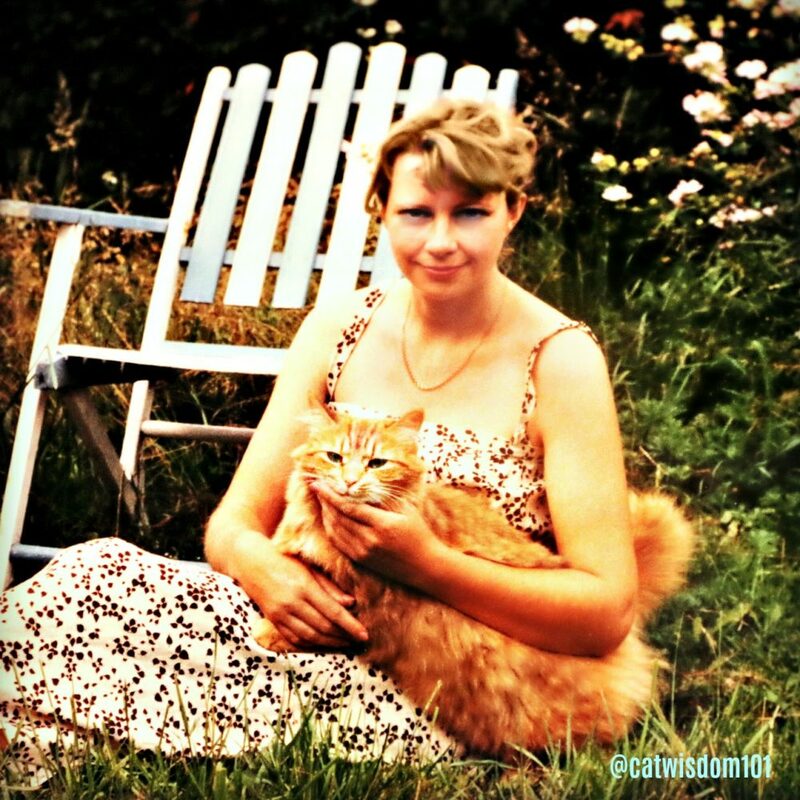 Orange, red or ginger tabbies are famous for being good natured and Billy, a rare female red tabby was no exception. She deserves a stand alone post and I’ll write one soon. We also are in the same boat. The youngest who was socialized from a feral Momma and ‘promised’ to someone who changed their mind is now 4. The oldest inside is Ozzy at 18, Spyder hovering around 17, Keesta & Minnie at 14. With Angus, I think of our ages now and possibly how long he can live and hope we make it. The feral ahhh the ferals…. not so feral with just us, but they I worry about too and those I have less control over. I look at Punchy (now 20 or more) and wonder just how long he can go on. Itty the little deaf fella at a spry 14, Jemmie (I spell it Gemmie but thats how you say it) Angus’s Mom only maybe 6. And two boys wandered up last year, Floki guessing 5 and Jax about the same Many passer bys. I worry about their fate . It all takes it’s toll. Financially it is rough, because in addition to the cats , Odin the dog is 15, diabetic taking to shots per day and blind. Emotionally, it is a roller coaster some days too as we can leave for a short day outing but no more than that. These also are our last cats ……. and like you I really don’t remember a time without a pet. I love your photos, each and every one. What a very tough decision, but a responsible and loving one too. Come volunteer at a shelter where you can be grandma to the multitude! Enjoy them and then go home. We purrfectly understand the situation. We too are often overloaded and don’t do things because we have no one to really depend on to care for everyone. It certainly is not form lack of love or compassion for we are all overloaded with that it seems. These kinds of decisions are always hard to make but we have to always put the well being of our cats ahead of all else because we have made the commitment to care for them and being cat people we will rightfully honor that commitment bar everything….maybe that is where the “CRAZY” in crazy cat person comes into play. I too feel overwhelmed at times with the number of little dahlings that I care for but I pray for help and strength and courage and guidance and carry on at least for now. I shed a few tears reading this. For one, I am in a similar position and understand how difficult letting go can be. After ten years of avid rescue and caring for three colonies, I have had to say ‘no more.’ My husband and I are now in our mid-sixties, and between health issues and wanting to enjoy a little worry-free traveling, we can no longer foster or adopt. (We take separate vacations so one of us can be home with our five cats! Thankfully, I don’t like golf trips, which is what he does on vacation, and he doesn’t care for European sight-seeing, which is what I enjoy, but it is time for us to enjoy adventures together, while we are still able.) Anyhow, I have recently come to the realization that, for now, no more kitties. The emotional strain, as well as the physical work is catching up with me. It’s time for me to leave the rescue/fostering/trapping etc. to younger cat ladies and cat gents. I have one colony, which is down to one feral female, and I am actively seeking a sanctuary for her. Your photos of your early kitties are lovely. I have always enjoyed reading about your cats, and remembering your Merlin and Gris Gris still makes me tear up. I look forward to future posts and photos on your blog. Thank you for all that you do, and have done! I have an aging population too and am thinking these will be the last. On the other hand I can’t imagine being without a cat. It is a hard decision to make. Right now I don’t know of anyone who would take my cats when I am deceased but my veterinarian has said she would help to find them homes if it comes down to that. As for my ferals? I really don’t know. My human’s parents adopted a pair of young cats in the early-mid 2000s. They both outlived her mother, and one of them outlived her father, and is now staying in her own area of our house as a foster. It’s not an ideal situation, and she really could use her own home with her own human(s) but it’s the best that can be done for now. It’s good of you to step up and give a home. It’s a tough decision either way and not ideal. Hopefully she can be rehomed.